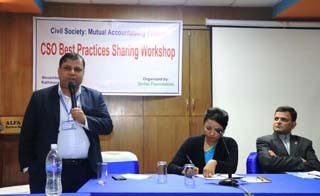 Workshop on CSO Best Practices was organized on 21st November 2018 in Kathmandu by GoGo Foundation. The event was presided over by Anita Bindu, President, GoGo Foundation. 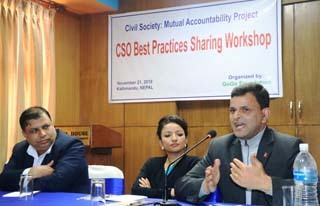 The core focus of the event was to bring forth best practices of CSO gained while working in different context. Altogether 4 CSOs (GoGo Foundation, JuRI, KIRDARC and Helvetas Nepal) shared their best practices primarily focusing on internal governance and self-regulation. GoGo Foundation briefly presented its policy initiatives and learning. As a best practice, recent example of collaboration between Transport Management Office and GoGO Foundation to improve driving license delivery at the Transport Office, Ekantakuna, Kathmandu under its corporate service responsibility. 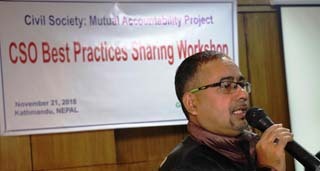 A senior officer from Helvetas Nepal briefly presented their initiatives on internal governance policies and practices. Helvetas found widely developed and practiced almost 22 policies and guidelines to improve and promote accountability and transparency. They have also a set-up a complaint redress mechanism to file complaints directly. 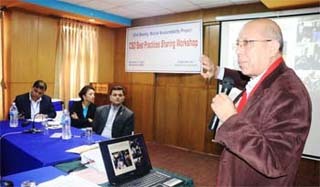 Similarly, JuRI Nepal highlighted learning on public litigation, human rights and some practiced based knowledge over the years. Also, KIRDARC representative presented their widely developed internal policies and management structures. 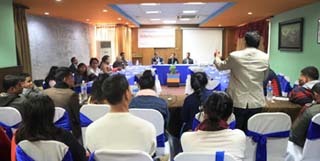 At the end of the program senior officials from Ministry of Home Affair, Under Secretary, Gyannath Dhakaland, and Nuranidhi Neupane, Director from Kathmandu Metropolitan City appreciated the GoGo Foundation's efforts to organize this kind of forum to discuss on CSO best practices and learning. They also appreciated GoGo's partnership with the Transport Office to improve driving license delivery services which can be replicated across the country.